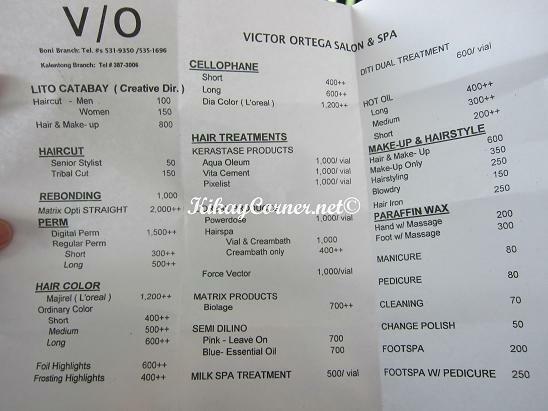 As for this Victor Ortega Salon experience I had, I was actually expecting better than what I got for a first impression. But I’m blogging about it anyway, because it is not a through and through bad feedback from me. Let us just say, the salon was able to redeem itself in my eyes before I left. From all the reviews and feedbacks that I have read, I encountered 4 out 5 who are pretty giddy and satisfied with the salon’s service. Yes, I also got my corner, with a mirror this time. Obviously, I wasn’t too happy when I took this shot. As for me, it was not such a good first impression. Blame it on the day I went to visit, September 10, a holiday. Eid ul Fit’r – end of the holy month of fasting by the Muslims. But the thing is, I called the day before for an appointment. They assigned to me a senior stylist by the name of Alvin. To say that the salon was jam packed when I got in was an understatement! It was a huge salon to begin with. But the customers, in my opinion are too cramped inside. They, I think, are taking in more than they can handle which I think brought about the bad impression I have of the supposedly “senior stylist” who only got to handle me once or twice. I found it unprofessional for anyone in a salon to complain and repeatedly murmur to the tune of, “Ano ba namang buhay ito,” et al. I had to ask the receptionist pointblank if they can still work on me. I also asked why would they put me on a schedule with a stylist that is obviously “booked” to his neck? Because I definitely am not willing to have someone like that handle my hair. I tried to keep my cool and give that character the benefit of the doubt. For one, I heard that he is not feeling very well. Whatever his reason is, that is definitely giving the salon a bad, bad name. If it was not for the good hands of Darwin, who later went on to work on my hair, I would definitely tag this salon A NOT TO GO BACK TO PLACE altogether. That is just about what is not nice about the place. Overbooking their stylist and the attitude of that particular senior stylist. But there are a few things I love, which I am not withholding my readers to know. First, I love that for the first time in all my salon visits, most of the stylist are real men, competent ones at that, and not gay. I just find that refreshing. Not that I have anything against about gay stylists. I would have to put my hands down and say, Victor Ortega Salon’s expertise is rebonding. They already have a system and they really know what they are doing. Yes, save for that instance with the Alvin character and the overbooking. Let’s just say, no salon is perfect. Or at least, I have yet to find that one yet. As opposed to how the staff of Tony and Jackey worked on my hair last year to the way Darwin of Victor Ortega Salon expertly worked on my hair is way incomparable. To think that Tony and Jackey used a pricier brand for a rebonding agent L’Oreal Extenso, no less. I’m not sure what Victor Ortega used on me. I will ask the next time I get my hair done. Let’s just say, the waves on my hair (bangs part) came back shortly (a week) after my treatment with Tony and Jackey. The rebonding treatment I got via Victor Ortega Salon is now a few days short to a month but I’m not seeing any waves. I would say that it has got to be the hands that worked on my hair. Compared with Tony and Jackey. I had like three of them work on my hair at the same time. Busily gossiping how bad one of their superior is and that of another staff. They were too busy gossiping that they failed on working on my hair properly. As for Darwin, who, for the most part, single handedly worked on my hair after “senior stylist” Alvin left, which was actually a relief for me. Darwin was detailed enough to work on every nook and cranny, if you may, of my hair. 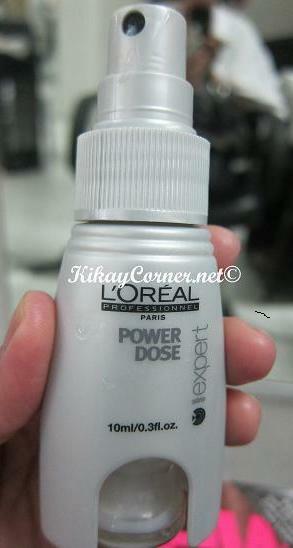 Since my hair was previously colored, Darwin applied a vial of L’Oreal Power Dose on my hair. This made a whole difference as I stepped out of the salon with nary a trace of dry ends on my hair. My hair remains shiny up until now. 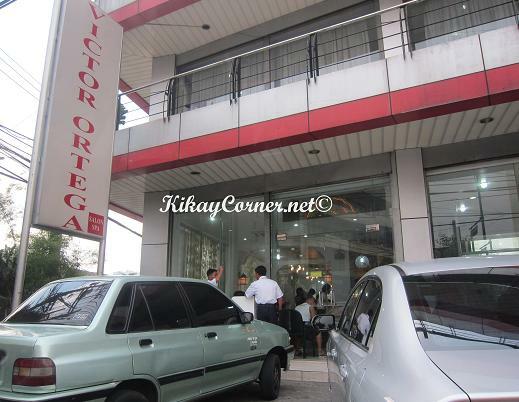 Even though this salon visit was not exactly perfect, I will choose Victor Ortega Salon in heartbeat over T&J. I only paid P2,000 for this treatment. Yes, including the L’Oreal Power Dose treatment. Half of what I paid for when I visited Tony and Jackey last year. hi. do u still recommend this salon? for rebonding? Hello Mel! I haven’t been back there since 2010. The rebonding treatments I have had my hair endure the last few years are now taking their toll on my poor hair. For that reason, no more rebonding for me from now on. Just in case, you’ll check Victor Ortega out, make sure to ask for Darwin to work on your hair. He practically redeemed my “bad experience” with Victor Ortega during my rebonding treatment there.